Medieval Morsels: Purple carrots - who would believe it? I visited the city of Gdansk in Poland at the end of October. I had not realised what a medieval treasure it is, one of Europe’s largest historical centres apparently. A most welcome revelation in fact. 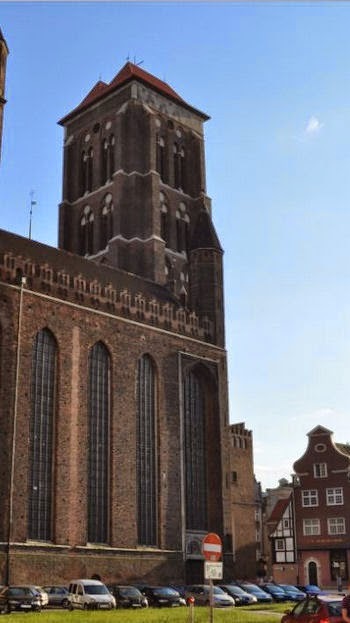 But what impressed me greatly amongst some of the largest surviving medieval brick buildings in the world was….wait for it….a market stall full of colourful carrots! But first, some architecture - lovingly and painstakingly restored. Because in 1945, at the end of World War II, Gdansk was reduced to rubble. The city authority took a decision to rebuild from the bombed ruins, faithfully reproducing original external architecture and internal decoration. This was achieved first, by using historic and contemporary sources and second, by using as much reclaimed medieval brick and other building material as could be sorted and salvaged from the devastated townscape. The project is still ongoing, witness medieval warehouse walls on the city’s Granary Isle still to be restored. However, one restored granary now serves as the home of the Baltic Philharmonic Orchestra and another is an enticing four star hotel. Today in Gdansk’s Stare Miasto (Old Town) you are carried back to the Middle Ages. In amongst the reconstructions are many authentic old buildings. According to the Gdansk City Guide most streets are located where they were in medieval times, and many retain their original 500 year old names. 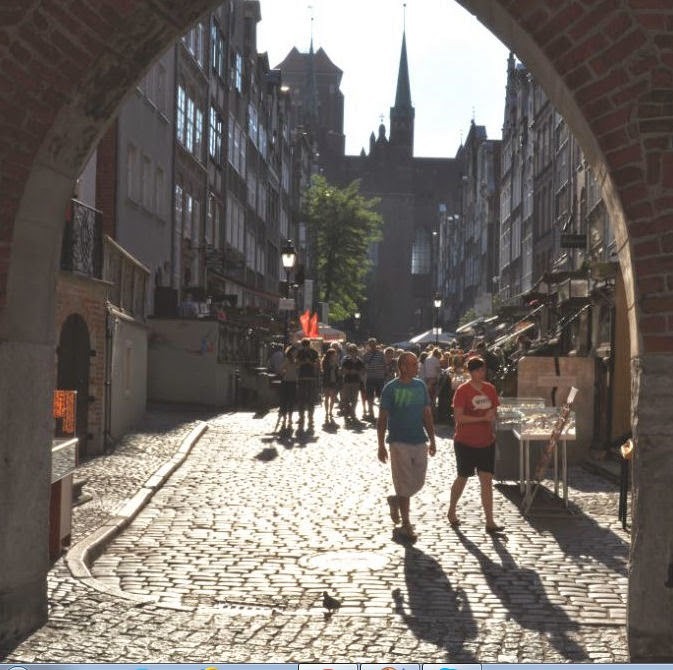 Above all Gdansk was a medieval harbour town, a Hanseatic trading port whose storerooms and warehouses on the wharves lay side by side with entry gates through the medieval walls, allowing daytime access to people and produce. Nestled amongst these impressive utilitarian buildings, all made of brick, are the town houses built by rich merchant guildsmen as well as palatial houses built for barons and kings. My home town of King’s Lynn in Norfolk was also a Hanseatic trading port, there is absolutely no doubt that sailing vessels laden with timber, wool, grain, herrings and more plied between the two. As a student of geology I did wonder where the nearest stone quarry was - obviously many miles distant to make it cost effective for medieval man to fire clay bricks instead. A labour intensive process demanding forests of wood, or charcoal produced from the trees, to fire those brick ovens. This area of Europe was in fact heavily glaciated as recently as 20,000 years ago. The present landscape is swathed in hundreds of metres of loose glacial deposits, including glacial clays laid down directly by continent-wide the ice sheets. So solid bedrock was inaccessible. Itinerant medieval stone masons would find no work in Gdansk! Now to those Gdansk carrots, an ancient variety whose natural colour is purple. And in Medieval times this was the case, but genetic variation commonly resulted in yellow and white carrots too. It is from such carrots that the today’s now common orange variety was bred, probably by Dutch horticulturalists. MedievalMorsels authentic carrots for a historic dolls house! 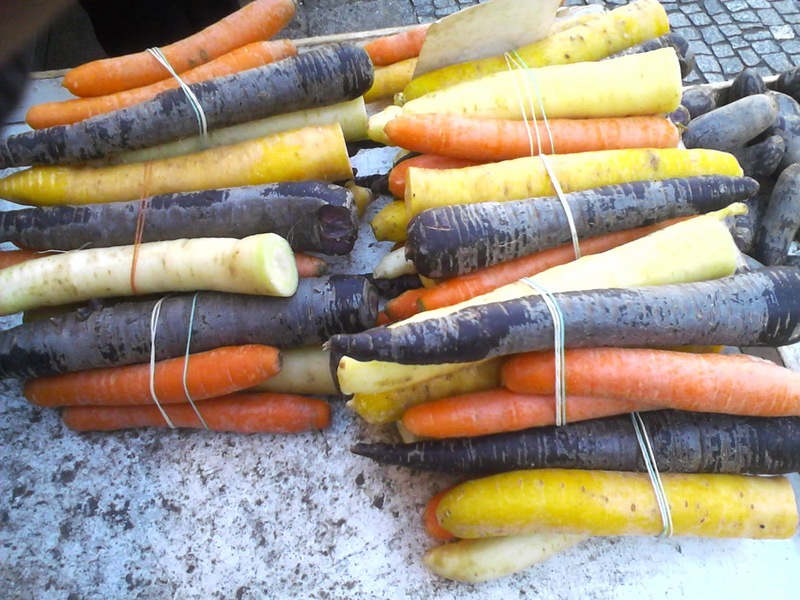 The real thing - display of multi-coloured carrots in Gdansk market! Here too are MedievalMorsels one inch scale carrots, modelled at one inch scale for your medieval, gothic or Tudor dollhouse! Or to collect as a desirable miniature!